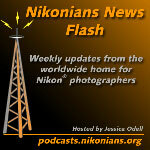 This week's episode includes news about Camera RAW, Aperture, the D40, a new CoolPix, as well as contest information! Adobe's Camera RAW 4.0 and Photoshop CS3 are now available! Apple has released the latest version of Aperture..1.5.3! Test images from Nikon's new CoolPix P5000 are available. Nikon's D40 has won yet another award. Segment #1 of the Photographers of the Year 2007 is almost closed, and Segment #2 starts May 1. Check here for more information. Good news for our members who prefer Ilford Film - the popular ILFOCHROME and ILFOCOLOR emulsions are still in production. Ilford Imaging Switzerland GMBH is dispelling rumors that ILFOCHROME is now unavailable. They are also ensuring US and Canadian distribution through the recently minted agreement with WYNIT Inc. of North Syracuse, NY. For our members seeking to explore the exciting world of commercial sports photography or even learn new trade techniques; the Sports Photographers Association of America is kicking off their 2007 tour 25-Jun-2007 in Portland, Oregon USA. The one day seminar will feature topics such as posed action shots, learning the basics of the business, logistics, distribution, sales strategies and more. Admission is USD95 and includes lunch. The tour will make the rounds at various Western and Mid-Western US locations. 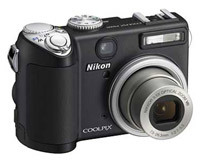 Congratulations are in order to Nikon on winning the TIPA award for best entry-level Digital SLR with the D40X. Other notable winners include the Coolpix P5000 for Best Digital Compact camera, the Nikkor 55-200 DX VR for Best Entry-level Lens, and Apple's Aperture workflow program for Best Photo Software. Congratulations to all the winners! This week on The Image Doctors: Jason & Rick bring you tips on setting white balance, discuss how and when to use your camera's auto ISO setting, and give suggestions for shooting locations in Colorado. Testing the Nikon Coolpix P5000 digital compact camera, Dennis Hissink, Chief Editor for LetsGoDigital took it along for a vsit to the Railway Museum in Utrecht, Holland. We recommend you check the resulting gallery of test images of this new 10Mpix camera, auto adjusting up to ISO 3200 for low light ambient light. Get your colors spot on with X-Rite's Picture Perfect Color Seminar Tour. The full day instruction will walk you through integrating color management techniques into your post-processing workflow. The tour is supported by Adobe, Epson, Fujifilm and many other industry names. The 40-city tour starts 15-May in Boston, MA. Registration is USD299 and discounts are available. Digital Photo Workshops - At Your Drugstore? Digital photo workshops everywhere - but at your local drugstore? CVS Pharmacy, a nationwide chain of convenience drugstores headquartered in tiny Rhode Island, is sponsoring Digital Sundays - a summer series of workshops running every Sunday through August of 2007, and designed to teach consumers everything from camera settings to printing options. Eagerly awaited by many Intel Mac owners, the latest edition of Photoshop has finally shipped and is available for order. For our members still on the fence, check out the Macworld Review that gives it a thumbs-up with some minor nits about the interface. The latest iteration of Apple's workflow program focuses on overall reliability and performance. For Mac platform users, Apple recommends installing OSX 10.4.9 for it's ability to read a variety of DSLR RAW files, including Nikon models. Adobe pushed out Camera RAW 4.0 and it's latest DNG Converter late last week. But CS2 owners beware; the RAW converter is not backwardly compatible with Photoshop CS2 and Elements 4.0 or earlier. Our European Nikonians have been invited to assist with a ten-minute survey that could earn them one of three brand new A3 printers. The prizewinners will be drawn from people who complete the entire questionnaire. Your comments will be treated in the strictest confidence and it will not be possible to identify you personally by your responses. All the latest about The Nikonians Academy expansions, Sony memory cards, and memory cards in vending machines! The Nikonians Academy is proud to announce new venues throughout North America! Check here for the complete list of cities and workshops in 2007. Kingston memory from a vending machine in Gatwick Airport! Sony is entering the memory card market! Find out more in our news blog. Forum of the Week: Bags, Backpacks, & Cases. The "What Bag" FAQ page can be found here. This week's contest article can be found here. Tune in to find out what to do! Weekly Photo : Cadillac Ranch. A strong growth in traffic and membership throughout the last year causes the Nikonians community to switch to a larger server system. The system consists of a cluster of servers and is scheduled for launch in May this year. Sony makes a late entrance to the CompactFlash market with two tiers of memory cards; a 66x set with 1GB to 4GB capacities and a professional set of 133x 2GB and 4GB cards backed by Sony's Image Recovery Service. In what could be one of the most provocative articles for this year, well-known photojournalist and industry pundit Dirck Halstead writes about the coming death of dedicated still photography at the hands of HD video cameras. "First, most of the major camera manufacturers that are now associated with still photography will probably be out of business by 2016. Of the majors now selling cameras, I would put my money on only Canon to survive." Mike Hagen, Director of the Nikonians Academy, announced today a big expansion on workshops. Initially present in 13 locations, workshop listings for 2007 now cover 23 major cities of North America, including Vancouver and Toronto in Canada. The very popular Master your DSLR series includes one day seminars each on the Nikon D200 and D80/D70/D70s plus two days sessions on the D2X/D2Xs/D2Hs DSLRs. The current roster also includes workflow, with Nikon Capture NX hands-on in depth instruction, as well as Nikon i-TTL flash. The successful personalized format of no more than 12 students per class is kept, ensuring no question goes unanswered and that the instruction level is set depending on attendance, from beginners to working pros. Make sure you book early, Nikonians Academy Workshops are sold out very fast. They're everywhere - lines of automated machines selling sodas, chips, candy and sometimes even small meals, but flash memory? Memory maker Kingston Technology has partnered with UK retailer MyMemory Ltd to provision the first-ever Flash Memory vending machine at Gatwick Airport in London. Our colleagues at LetsGoDigital report on a dedicated real-estate digital camera; with a 22mm f2.0 lens and 90 degree FOV, internal memory of up to 400 shots and 640x480 resolution, it promises to be a "simple to use and download" solution for on the go realtors. Pentax and Hoya have stepped away from the table for now over the proposed merger, but a tendered offer may allow the deal to continue later on. Did you win? Listen in for the winner of the final HP Photosmart printer, as well as all the latest from the Nikonians community! Congratulations to the First Place winner of our Photographer of the Year 2006 Contest, Knut Askim! 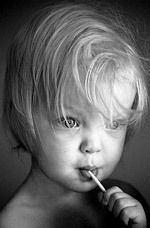 To see his winning shot, "Day Dreamer", click here. Contact The Changing Man if you're interested in wedding photography in Edinburgh next January. April's Online Photo Assignment is Multiple Exposure. Contact Ben if you have any advice on portrait shots in the DC area. Nikonians Academy North American Workshops! As promised, here's the direct link to the information on our workshops in May! Congratulations to David Ralph of Horseheads, NY! Winnipeg, Canada. Chris Gray, Director of Nikonians Photo Contests, announced today the winners of the Nikonians Photographers of the Year 2006 Contest. First Place was won by Nikonian Knut Askim, username "DrBjarnt", from Norway, with the portrait "Day Dreamer". Knut will receive a Hewlett-Packard B9180 Photosmart Pro Printer for gallery-quality prints with extended archival properties, a 3-Years Nikonians Gold Membership and a Certificate of Nikonians High Photographic Achievement. Second Place was awarded to Nikonian Nico Housen, username "nhou", from Belgium, for his wildlife image "Gentle Gentoo". Nico will receive a Capture One Pro RAW workflow software by Phase One, a 2-Years Nikonians Gold Membership and a Certificate of Nikonians High Photographic Achievement. For the 3rd Place Award and prizes, Nikonian Russ Barker, username "LeCCy" from the United Kingdom, impressed the judges with his landscape "Jokulsarlon". Russ will receive a Color Efex Pro 2.0 Software Imaging Pack by Nik Software, a 1-Year Nikonians Gold Membership and his Certificate of Nikonians High Photographic Achievement. Congratulations to all participants and to the winners.